For all you science geeks out there *look away now* – I am going simple, short and (ahem) sweet. The mechanics behind the body’s use of sugars is complex, but you only need to know the basic facts. 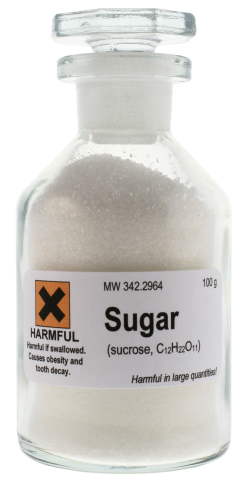 The important fact to recognise is that not all sugars are bad for you, I am singling out the primary nasty: Fructose. I cannot emphasize enough that the body needs sugar; ultimately all of our food that we consume is converted into Glucose whether its protein, fats, carbohydrates, you name it, our body’s only ‘battery’ is glucose. It is just fructose which is the problem. Here’s a fact to begin with: Fructose causes seven times more cell damage than glucose and releases 100 times the number of oxygen radicals (which kills everything in sight). Fructose is not our friend. Your body metabolizes fructose completely differently to glucose. The entire burden falling on the liver. As people consume fructose in enormous quantities, the negative effects on the body grow exponentially and intensify. Carbohydrate metabolism is the backbone for problem number one: every cell in our body ‘burns up’ glucose, whereas no cell likes fructose and it ends up being turned into fatty acids, tricglcerides, and LDLs (nasty cholesterol). End result = fat stores. The liver facilitates this conversion, purely because the body sees fructose as a poison, in fact the metabolisation creates numerous waste products and toxins, including uric acid, which drives up blood pressure and causes gout (more to add to the list!). Alongside the metabolism of the food consumed is the brain’s reaction to ‘fullness’ from sugar. Where glucose reduces production of the hunger hormone ghrelin and stimulates leptin, the appetite suppressing hormone, fructose has no effect. This is the reason you never feel full after sweet treats and end up wanting more. My super brief whistle top tour of the science really covers the basics. Fundamentally our digestion has not changed over 130,000 years, and our bodies are not designed to utilise fructose due to its scarcity throughout evolution, hence our problems with sugar exposure and diet-related diseases in the 21st century. I would urge those science-minded to read any book by Robert Lustig to obtain the nitty gritty – its shocking stuff. The short and sweet of it is that your body does not need fructose; it mucks up hormones and makes you sick through layers of lard, cholesterol, and hypertension. The baseline = your body will feel and look pretty crappy, give it some love and cut, cut, cut that fructose!